It may seem inappropriate to even consider wetland plants when Southern California is experiencing one of the driest seasons on record. But in a hot, dry summer, the lure of lush wetland plants is almost irresistible. If you like the idea of native wetland plants – but don’t have the room or water to spare for a rain garden (see March 2013) - consider planting a ‘wetland in a pot’. You can create a mini-marsh or attractive wetland container that satisfies your craving for green without feeling guilty about wasting water. The first consideration is where to locate your container. Most wetland plants need sunlight for at least 3-4 hours a day; so you can locate your wetland container in a sunny part of the garden. If you’re fortunate, you may be able to find a location that gets enough sun and is also near a shady seating area; for example, on the edge of a covered patio. There’s nothing like admiring your summer ‘wetland’ from the comfort of a shady chair. Another consideration is hose or drip irrigation access. You’ll be watering your ‘wetland’ at least weekly during summer, so be sure you’ve got easy access to water. If you choose a large pot, your container garden will be heavy. Better to locate it correctly before it gets filled with damp potting soil and plants rather than after! Creating a wetland in a container (pot) is fairly easy. First you’ll need a pot or other container to hold your ‘wetland’. We suggest a container at least 2 ft. by 2 ft. and at least 1 foot deep. You can use a smaller size if you plant just a single plant (for example, a single rush (Juncus) plant). But remember that larger containers – and those made of impervious materials - remain moist longer than do small containers. The best choice is a container made of thick plastic, composite or glazed pottery. Another popular choice is a wooden half-barrel (whisky barrel) with a plastic liner. Even a concrete container will work. Many attractive choices are available - some for reasonable prices. Choose a pot that complements your home and garden – after all, you’re going to be admiring it a lot. If you have a choice, stay away from black or other dark colors, as these pots heat up too much in summer. Many large pots now come with a removable plug in the bottom hole. For most situations, it’s best to remove the plug. With wetland gardens, the choice is up to you. If you leave it in, you won’t have to water as often – but you’ll need to let the wetland dry out a bit more between waterings. If you choose wetland plants that require ‘well-drained soils’ then you should definitely remove the plug. You may want to choose a pot with a threaded plug (like a screwcap) that can be screwed in from either the inside or outside of the pot. Install it on the outside and you can remove it easily if your wetland garden needs better drainage. Late spring or summer is the best time to plant a ‘wetland in a pot’. Most wetland plants are not terribly picky about the choice of potting soil as long as it doesn’t have too high a manure content. We suggest using a commercial potting soil rather than soil from your garden. You’ll want to fill/plant your container in place, as it will be heavy and awkward to move once filled. Wet down the potting soil and let it settle before planting your plants. Leave at least 2 inches between the moistened soil and the top of the container (so you can flood the container occasionally). 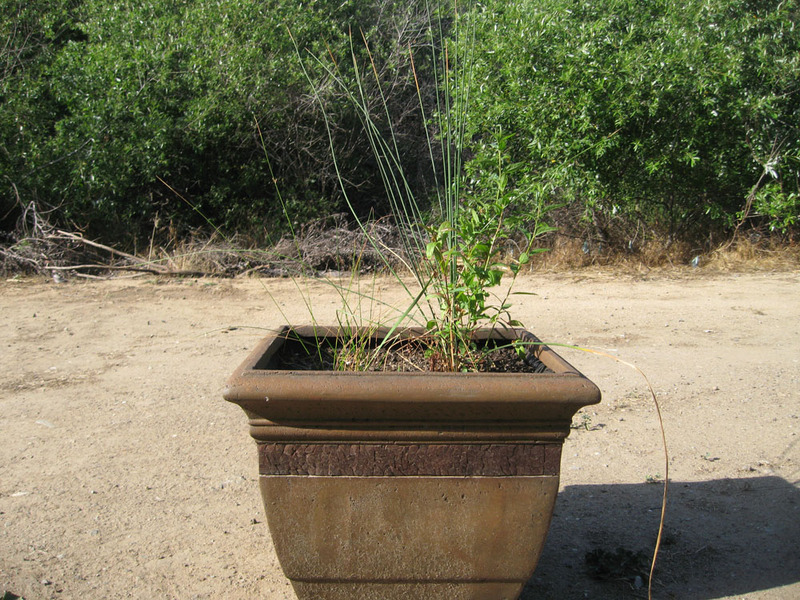 Many California wetland perennial plants are suitable for growing in containers. The easiest are the rushes (Juncus species). These mostly evergreen, grass-like plants have nice shapes/colors and interesting flowers. They look good alone or combined with other wetland plants. Some require quite moist soils while others are a bit more drought tolerant. If you combine several plants in a ‘wetland’ be sure that all have similar moisture requirements. Several other wetland perennials are appropriate for a ‘wetland in a pot’. These include the Narrow-leaf Cattail, the Scouring Rushes (Equisetum species) as well as several more conventional wetland perennials (see below). When choosing plants, be sure to note their mature size. Some wetland plants are low-growing, while others (like cattails) grow to 4-5 feet tall or more. The taller species survive just fine in containers; but you don’t want to be surprised when a Cattail or Tule grows to its full height of 6-8 ft. or more. Many wetland plants look beautiful all by themselves. In fact, some of the most elegant ‘wetland pots’ we’ve seen contain just a single species of Juncus or Equisetum. But if you want to include several plants in your ‘wetland’ then go ahead. Many nice combinations of plants are possible. For example, you might combine several rushes with different colors/flower characteristics. Another possibility would be to pair a rush with several of the more conventional perennial species like Willow Dock and Showy Milkweed. The only trick is to combine plants with the same water and other cultural requirements. 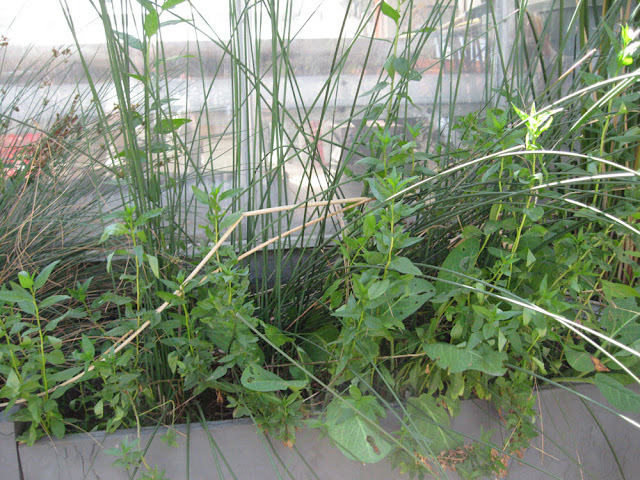 We suggest using no more than three different plants for most home ‘wetlands in a pot’. If you have a very large container (at least 6 square feet) you can get away with more. Consider height, flower and foliage characteristics when choosing an attractive combination. For example, pair an upright species with one that sprawls and covers the soil. The resources below provide more information about the individual plant species best suited for ‘wetland pots’. Wetland plants are often ‘spreaders’; plants that increase their size by short underground stems (rhizomes). This allows them to take advantage of optimal (wet) conditions. You can count on the plants in your ‘wetland’ to increase in size – sometimes rapidly. This means you’ll need to do a bit of repotting each year to keep the plants happy. Some rushes are slow growing, only requiring repotting every other year if grown alone. Other wetland plants need thinning twice a year in our climate; once in spring and a second time in late summer. Fortunately, most wetland plants are incredibly robust. You can dig the entire plant out of the ‘wetland’, break it apart with your hands (or cut with a stout knife or cleaver) and repot the ‘extra’ pieces into recycled pots. Just be sure there are 4-6 new stems/sprouts per piece. The extra plants make nice gifts; be sure to label them so that the recipient knows what s/he is getting. Replant one piece and you’ll have a rejuvenated wetland. Add a little fresh potting soil and that’s about it. Wetland plants like moist soil. You can use drip irrigation or simply water with a hose when needed. Dig down into the soil to assess its wetness. If the soil is dry at a depth of 2 inches it’s time to water. Remember that pots dry out surprisingly quickly in hot, windy weather. Water until the soil is fairly moist but not muddy. If the soil develops a sour odor – or if the plants become yellow – let the soil dry out to a depth of 6 inches before watering and consider removing the drain plug (if applicable). Native wetland plants, like most local native plants, like to dry out a bit in the fall. Gradually water less frequently (let the soil dry out more) beginning in early September. Once the rains begin in November you can normally leave the watering to Mother Nature. That’s really all there is to creating and maintaining a ‘wetland in a pot’. 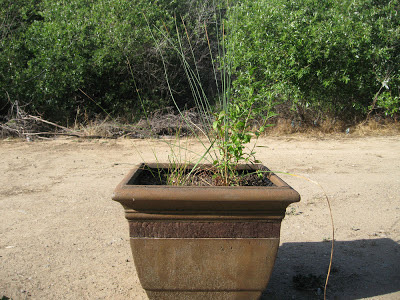 With a little care, wetland pots can give you greenery, flowers, interesting foliage – even butterflies - for many years. Native bunch grasses make extremely useful filler plants. As part of a mixed grass planting, or tucked in around trees and shrubs, they add interest, texture and habitat value to the garden. One of our favorites, Koeleria macrantha, is blooming in the garden right now. Prairie Junegrass grows in many areas of the United States from California to the east coast. Locally, it can still be seen in the Santa Monica and San Gabriel Mountains. It was once a component of the lowland coastal prairies of western Los Angeles County and almost certainly once grew in Gardena, California, where Mother Nature’s Backyard is located. Junegrass is a perennial bunchgrass of moderate size. It has narrow leaves (blades) that form a mound 12-18 inches (30-45 cm.) tall and wide. 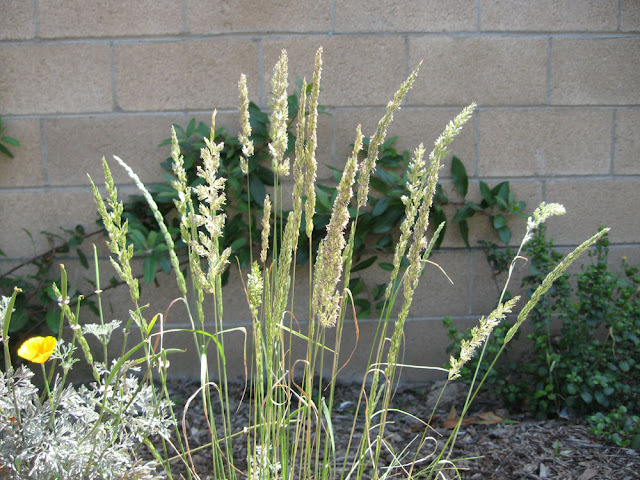 Junegrass doesn’t form a spreading sod; it’s a bunch grass, retaining its clumping form throughout life. It has fibrous roots that reach a depth of 1-3 feet (to about 75 cm). While other native grasses have deeper roots, these are plenty deep to give Junegrass a water-wise edge over typical lawn grasses (which have roots only 6-8 inches deep). The roots also make Junegrass useful for holding soil on slopes. Prairie Junegrass is a cool season grass. In our part of Southern California, it begins growing with the fall/winter rains and becomes entirely dormant in the hot summer/fall months. 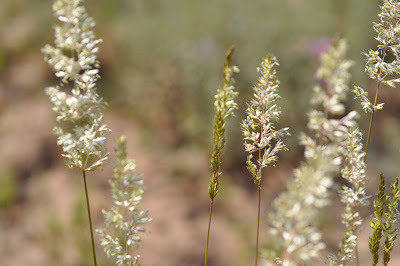 True to its name, Junegrass blooms in late spring, usually between April and June in our area. The flowering stalk, which rises 12-18 inches above the leaves, begins as a narrow spike and gradually unfolds into a loose plume of flowers (see above). The flowers turn from purple-pink to gold over the course of several weeks. Once the flowers are pollinated (they are wind-pollinated) the flowering stalk ‘closes’ again. Junegrass is fairly easy to grow. Plants are sometimes available from native plant nurseries (see the ‘Plant and Seed Sources’ page) but often you’ll need to start the plants from seed. Seeds can be directly sown into the garden but we suggest starting plants in recycled nursery pots (4 inch size works well). Seeds are best sown in winter in mild-winter Southern California (fall or spring in colder areas). If you plant from seed, be sure to order from a company that stocks locally-adapted seeds; this plant has a wide geographic distribution and local seeds will be better adapted to your local conditions. Use a small pinch of seeds in each pot, cover lightly and keep well-watered. Giving the seeds several weeks of cold-moist treatment before sowing may increase germination rates. Just place a moistened coffee filter containing the seeds in a plastic bag in the refrigerator. Junegrass likes a well-drained soil. If your soil is very slow to drain you might want to consider another species. We grow it in our clay-loam soil with no problem. In hot dry areas Junegrass prefers afternoon shade or dappled shade. In many areas, this grass grows in full sun, but in fact it takes more shade than most people appreciate. 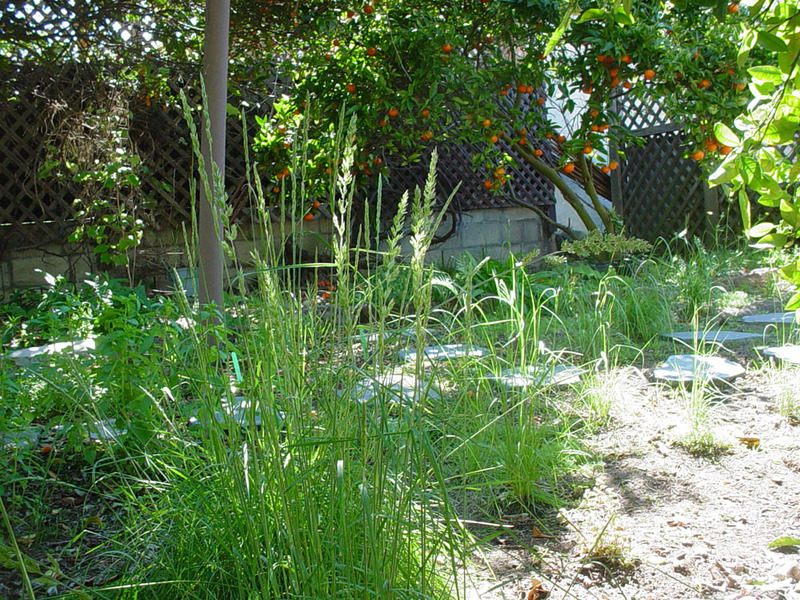 The picture above shows Junegrass growing beneath an orange tree in a local backyard. Junegrass needs adequate soil moisture during its growing season; supplement the rains if needed in a dry year. After flowering, Junegrass normally dries out in our area. In fact, it is quite drought-tolerant but you can probably keep it green into the summer with occasional irrigation. 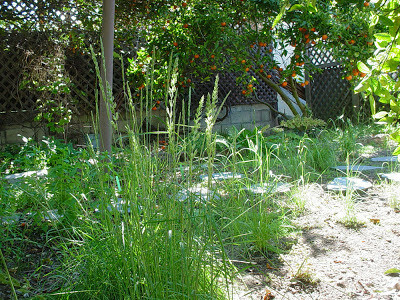 In our experience, Junegrass is pest-free and requires little care except for normal weeding around it. It may reseed if it likes your garden. 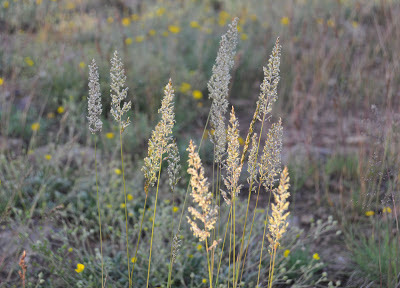 In the wild, Prairie Junegrass grows with other grasses, wildflowers and shrubs in mixed prairies and meadows. You almost never see it growing as a single-species stand. It looks lovely when combined with other native bunchgrasses in the garden. In our area, Junegrass, Coastal California Poppies and Purple Clarkia make an enchanting combination. Junegrass works well as a filler around water-wise native perennials and shrubs. Its texture adds a nice complexity to the landscape. Junegrass looks particularly lovely with the sun streaming through it (see below). 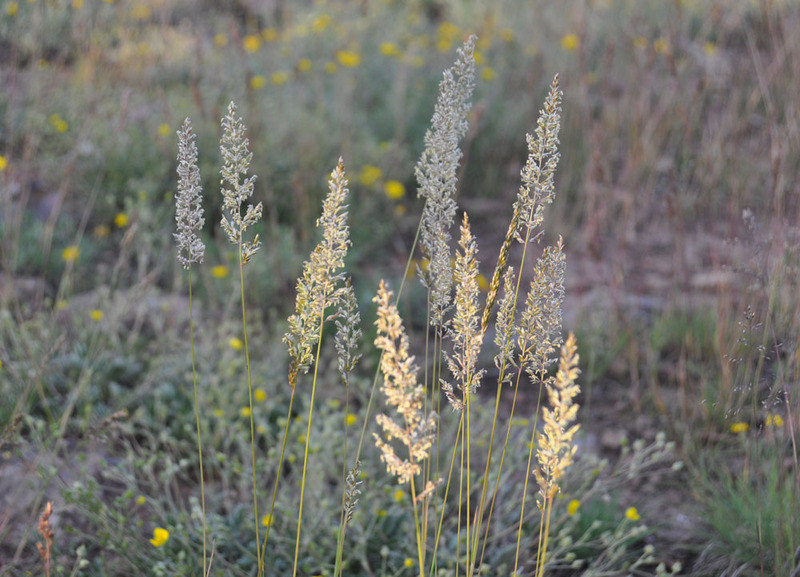 Like many native grasses, Prairie Junegrass has several practical uses. Native Peoples formerly ate the seeds – usually ground as flour – although they are small. Grass blades were tied together and used as scouring brushes, paintbrushes and brooms. 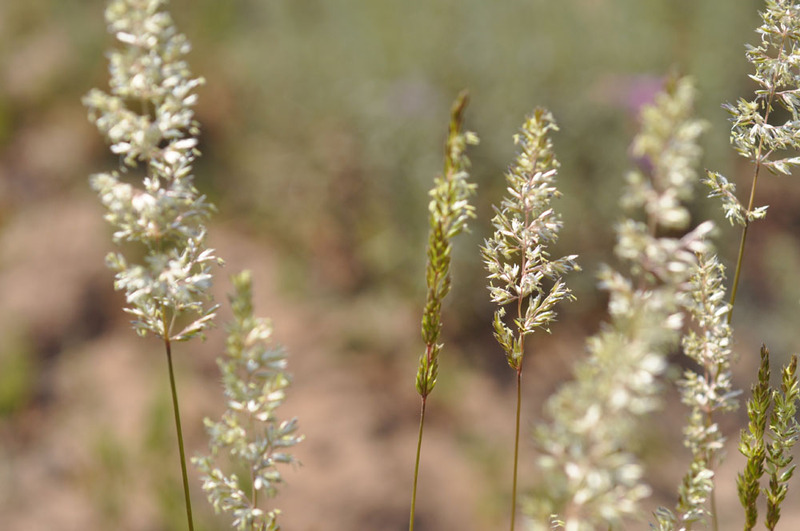 In our area, native grasses have been mixed with clay to give strength to adobe bricks. Like all grasses, Junegrass provides larval food for Skipper butterflies. If deer, elk or rabbits visit your garden they’ll be sure to browse – but not kill - the tasty Junegrass.